Easier said than done though. There is a lot of planning and choosing to do. Lots of research and time involved. I have been to a few different places and I have a pretty good idea of what I am wanting. But, nothing is set in stone yet. So, let's start with the decision I am pretty much 100% set on...the countertop. I love the marble look of this calcatta quartz! The grey veining really tickles my fancy! I chose a similar quartz for the boys' bathroom remodel (which I still have yet to post about), and I am so happy with that decision! There are many different options out there...lots of small movement, or larger more dramatic veins, creams, whites, thick, thin, etc. So, while I know the look I am going for, there are still lots of choices to pick from! Never in a million years did I think I would want gold hardware in my house! But, the more I look at the pictures on Pinterest, the more I LOVE it! I think it is so pretty and brings such a warmth to the room. My husband, however, is not sold on the gold. I also like the rustic black hardware too. With this house, I have to be careful not to go too terribly modern. It just wouldn't meld with the rest of the house. But, I still think we could do gold hardware if that's the direction we decide to go. Our current kitchen is all white, which I am super thankful for. It could have been green or orange, or whatever other colors were hot in the 70's. My husband is having a hard time coming to grips with the fact that I want to update our kitchen and still have it be all white. Men, sheesh. So, in an effort to compromise, I have been looking at adding some grey in the backsplash to change things up a bit without making the room feel dark. I love both the grey glass and the grey porcelain subway tile and I have to decide if I want to have them laid horizontally or in a herringbone pattern. I love the carerra marble subway tiles, but I feel like they would compete with the countertop, so I am leaning towards a solid color versus a pattern or something with movement in it. I also like the idea of having an accent tile behind the stove. We currently have cabinets above our range, but we are considering replacing those with a hood. 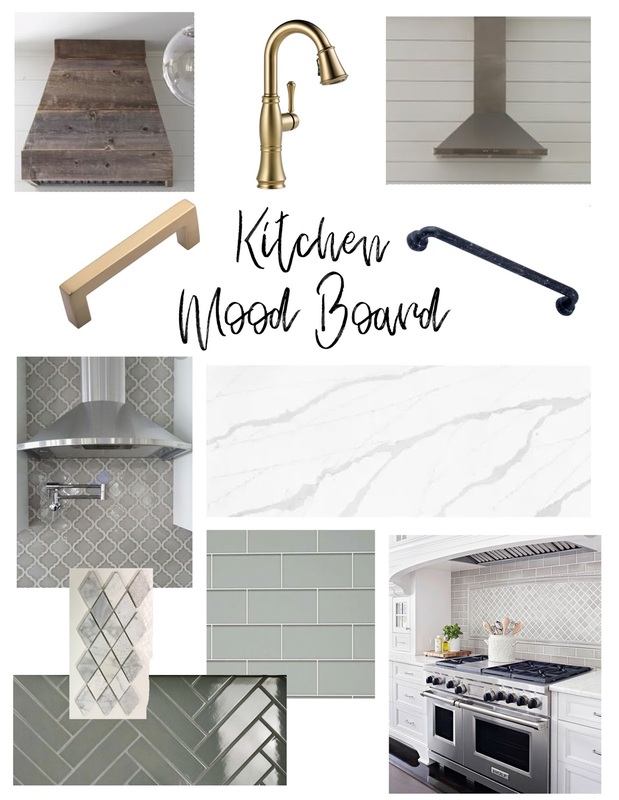 Again, I am undecided...do I go rustic with a wooden one, or sleek with a stainless steel hood, or in the middle with shiplap or something similar to our cabinets? They all look amazing! It's so hard to decide! With a hood and possibly the accent tile, I think it will really make a statement. I originally thought I wanted an arabesque shape as a feature tile, but now I am liking a more streamline look. As you can see, I have a lot to decide. Just when you think you have things figured out, something else comes along and boom, back to the drawing board! Eventually, I will make up my mind and we will proceed...but for now it's fun to look around and dream of the possibilities! Most of these pictures came from my Pinterest Kitchen board. If you want to get the original links, come on over to Pinterest and they should all be there!